What are the most popular online bachelor's degrees offered in Georgia? Georgia has taken strides to broaden its online educational resources in recent years. In 2005, the state launched the Georgia Virtual School, which provides virtual and remote courses to post-elementary students. The University System of Georgia, which includes 29 public schools, provides online and distance learning opportunities to college students. Several other initiatives, including GeorgiaONmyLINE, demonstrate the state's commitment to helping students access a variety of educational opportunities online. Currently, there are more than 300 online programs available in Georgia. Prospective students should visit GeorgiaONmyLINE to browse the extensive course and degree offerings available throughout the state. The service allows students to quickly and easily enroll in the program that best matches their educational and professional goals. Despite a commitment to innovation in education and online learning, Georgia is also home to soaring tuition rates that outpace the national average. Between rising tuition costs and the availability of distance education programs, many students are looking into online degrees, where costs are generally lower. UG, located in Athens, Georgia, is one of the best online colleges in Georgia and a top public research university offering online graduate degrees, two undergraduate degree programs, and an array of certificates and individual courses. The two undergraduate degree programs are in business and special education. UGA's eLearning Commons (eLC) serves as students' virtual classroom and live portal into events and news occurring at the university. Students have access to a dedicated online learning center for questions or issues related to their class or the eLC platform. UG accepts a variety of financial aid sources, including corporate and military assistance, and offers a free online financial education program to all graduate students. A distance learning librarian is available to help students navigate the college's eReserves and answer research related questions. In 2016, UG began offering its online students money-saving initiatives through the adoption of digital textbooks and other open educational resources. Brenau's online courses are structured in an accelerated 7-week format and taught by certified online faculty who are required to complete a 4-week online teaching certification course. Students have the opportunity to evaluate each course at its conclusion; all student comments and suggestions are reviewed by the corresponding dean and academic chair. Brenau offers 16 undergraduate and graduate degrees online, including an associate's-level degree in Liberal Studies and a new bachelor's degree in Psychology. Undergraduate degrees include Organizational Leadership, Early Childhood Education, and Accounting. Courses are accessed through the Canvas learning platform. Online classes have an enrollment cap of 20 students, optimizing online relationships between peers and the instructor. An Online Student center provides students with access to library, email, and bookstore resources. One of the best online colleges in Georgia, Brenau is a liberal arts school with a women's only college in Gainesville, Georgia. Clayton State University, located in Morrow, offers an online program that is taught through a flexible format. The school offers degrees at the bachelor's and master's level. Bachelor's programs include business administration, nursing, dental hygiene, and information technology. Master's programs include nursing, archival studies, and business administration. The MBA program is taught completely online, and students can earn the degree in 12 months. MBA students must earn at least 33 credits. Courses in this program include finance, marketing strategy, managerial accounting, and concepts of quantitative methods. Students are required to complete a capstone project. Some applicants may be required to send in GMAT or GRE scores. This is dependent upon their undergraduate GPA. Online students are offered the same resources as on-campus students. Through the Center for Academic Success, online students can sign up for tutoring appointments in a variety of subjects. Distance learners are also assigned a personal adviser, who can help them register for classes. Online courses are taught through the D2L learning management system. Located in Statesboro, Georgia, about an hour's distance from historic Savannah, Georgia Southern is one of the top Georgia online colleges. GSU is Georgia's largest university, with over 20,000 students from all 50 states and 86 countries. The school offers online graduate degrees and certificates through four of its colleges, and three undergraduate degree programs, including a BS in Information Technology and an RN-BSN degree. GSU is a member of the SREB electronic campus, which offers out-of-state degrees at in-state rates for participating state members in the southern U.S. GoVIEW is the university's collaborative learning platform, powered by D2L. Its extensive list of online graduate education degrees have been recognized as among the top 75 in the nation by U.S. News & World Report. GSU students have access to live chat with a librarian and an extensive set of research databases. GSU is recognized as a leading research university by the Carnegie Institute and is home to many innovative research centers and laboratories, including the Center for Educational Leadership. One of the top online colleges in Georgia, Luther Rice has been offering fully online undergraduate programs for more than 15 years. Students do not need to live in the state to take part in these programs, and all learners pay the same tuition rate. The school boasts graduate studies in apologetics, biblical counseling, christian studies, leadership, and ministry among its online degree-granting programs. The school also offers an online bachelor's degree in religion with a concentration in biblical studies to students seeking specialized curriculum in the Christian faith. Most online courses incorporate video lectures that allows students to take and complete coursework on their own time, enabling learners to maintain their personal and professional lives while earning a degree. Kennesaw State has 13 academic colleges on two Atlanta campuses - Kennesaw and Marietta - and a recognized Carnegie doctoral institution for highly-engaged citizens. In the past five years, the university’s research budget has soared from $4.3 million to $51 million, opening new research opportunities for students and faculty. Kennesaw offers over 70 undergraduate and graduate degree, certificate, and endorsement programs, and 500+ online and hybrid courses through KSU distance learning. KSU’s online graduate degree programs in Computer Information Technology and Business Administration have been ranked among the top in the nation by U.S. News & World Report. Students have access to a comprehensive set of academic and support services, including KSU student success services, which offers phone or email consultations from certified advisors and mental health counselors. KSU is a member of the Southern Regional Education Board's Electronic Campus, which shares eLearning resources and the D2L Bright Space learning platform. The majority of online classes at Kennesaw State are 100% online, though a few may require a single on-campus visit. A leading Christian university and one of the best online colleges in Georgia, Toccoa Falls provides co-gender training and education for students wishing to enter the ministry or the workforce as a representative of Christian values and teachings. TFC continues to grow its online offerings, with 12 bachelor’s, associate, and certificate programs currently offered online. Online programs include Counseling Psychology, Business Administration, and Ministry Leadership. Students have access to a dedicated online librarian who provides assistance in finding resources and checking out books. Online students complete four semesters of Service & Outreach during their distance studies, it’s a unique opportunity to engage with local community organizations or churches and represent Toccoa Falls’ values. Students within driving distance of campus are always invited to participate in athletics, student clubs and organizations, chapel services, and other special events on campus. TFC maintains an average 93 percent course completion rate by its students. West Georgia's SACSCOC-accredited online and hybrid programs are offered at the undergraduate and graduate levels, including certifications and specialist degrees. One of the best online colleges in Georgia, UWG was named the University System of Georgia's school of the year for 2015. UWG offers the highly-personalized eMajor—a bachelor's of science with a major in Organizational Leadership. This program is an ideal option for traditional and nontraditional students who seek an alternate degree route that conforms to their specific career objectives. The eMajor is customizable through choice of electives and the maximum earned credit is based on professional, military, and community experiences. Online tuition is offered at the same rate for all students, regardless of residency status. Students can tune into UWG's student-run WOLF Internet radio or stream live newscasts about events, sports, people and more through the student-run WUTV Weekly Newscast on YouTube. Columbus State integrates its core values of excellence, engagement, creativity, servant leadership, inclusion, and sustainability into its entire university experience. As one of the top Georgia online colleges, CSU enrolls more than 8,200 students at its main-campus, RiverPark campus, and online. CSU Online provides access to a range of undergraduate and graduate degree programs and certifications, and a longer list of partial and hybrid online courses. CougarVIEW, CSU's online course system, is powered by Brightspace and offers access to a range of digital learning tools and resources including Blackboard Collaborate, Atomic Learning, and several other tools that contribute to a more engaging online experience. Blackboard Collaborate is software for web conferences and document sharing; Atomic Learning is an online professional development and learning resources database. CSU is a partner with the SREB electronic campus, expanding its reach to students throughout Georgia and other participating southern states. Students have access to convenient online exam proctoring through ProctorU. Located in Americus, Georgia Southwestern State provides a variety of online programs to students, including three bachelor's degrees, two master's degrees, and one graduate certificate. Each program offers students the self-directed learning opportunities they need to finish their degrees as efficiently as possible. In 2015, GSW partnered with Dalton State College to offer an online bachelor's degree in criminal justice. The program caters to nontraditional learners, members of the military, and returning students looking to complete their studies. All online learners pay the same tuition rate, irrespective of state residency. The university offers financial aid counseling by providing students with grants, loans, scholarships, and other opportunities to help them fund their education. Thomas is a non-profit, four-year university located in historic Thomasville, Georgia, a rural community about 35 miles north of the Georgia-Florida border. As one of the top Georgia online colleges, TU is primarily a commuter campus, with a diverse student body that consists of professionals from a variety of backgrounds. TU offers a diverse handful of online bachelor's and master's degrees, from Rehabilitation Studies to Business Administration. TU Transitioned from a religious to a nonsectarian institution in 1979. The school has over 1,100 students enrolled at the undergraduate and graduate levels and is known for its small class sizes (a 10:1 ratio) and close student-instructor relationships. TU offers a range of general and major-specific scholarships to qualifying students. Students have access to a fully online e-Bookstore, with digital, print, and rentals available through the Blackboard Learn-powered store. Online courses are delivered through the Blackboard Learn system, with access to Blackboard Collaborate web conferencing software and online proctoring available through ProctorU. Valdosta State, one of the top online colleges in Georgia, is located about 15 minutes north of the Florida state line. The university's “Blazer Creed” of civility, integrity, and citizenship is realized through encouragement of spirited debate and free exchange of ideas. VSU offers a wide variety of online and hybrid undergraduate and graduate degrees. Some are offered through the University System of Georgia collaborative Georgia ONmyLINE system. Courses are accessed through GoVIEW, the university's eLearning platform, which is powered by D2L and shared by schools in the University System of Georgia. Learning tools include Blackboard Collaborate for web conferencing with peers and instructors. VSU offers the SmartPath Core program, which allows students to complete a mapped-out, self-paced degree or certificate plan, and complete one course at a time, with the potential to finish a program in as little as three semesters. A reduced eTuition rate is offered to fully-online students. Middle Georgia State maintains multiple locations in central Georgia, including Macon and Eastman, with each campus offering specific facilities and programs. The school ranks high amongst Georgia online colleges. As Georgia's newest university, opened in July 2015, Middle Georgia offers distance learning programs that include bachelor's-, associate's-, and master's-level degrees. Adult and non-traditional learners can take advantage of specially-designed Adult Learner Pathways programs in aviation, IT, healthcare, and more. Students earn prior learning credit for professional, military, volunteer, and other related experiences, and customize a degree path that aligns with specific career objectives. Course materials and activities are accessed through the Brightspace learning management system, with 24/7 support online. All programs are accredited by Southern Association of Colleges and Schools Commission on Colleges. Online student resources include online study skills and workshop tutorials, as well as e-Advising services. Located in northeast Atlanta, Emory University serves more than 15,000 undergraduate and graduate students. The school, regularly listed among the best online schools in Georgia, delivers a range of online programs and courses that enable students to complete their degrees from home. The universities’ distance learning options include a doctor of nursing practice and a doctor of ministry degree, several master's degrees, and a bachelor of medical science in medical imaging. Students at Emory pay the same tuition rate regardless of their residency status. The school also allows students to start their studies at Oxford College, a sister school that sits on Emory's original campus on the eastern edge of the Atlanta metro area. Both the traditional and the Oxford paths give students access to comprehensive distance learning support and resources. With campuses in Atlanta, Savanah, France, and Hong Kong, SCAD serves more than 13,000 students worldwide. The school’s eLearning programs feature classes that have no set meeting times. Students watch video lectures and complete assignments when their schedules permit it, ensuring that they can fulfill both their filial and professional obligations while earning a degree. In total, SCAD offers 16 graduate and undergraduate online programs that students complete fully online. To apply, first-time students need a minimum 3.0 high school cumulative GPA, along with a score of at least 21 on the ACT or 180 on the SAT. However, those who fail to meet these standards may submit supplementary materials for consideration. Students pay the same tuition regardless of their state residency status. The online programs at Mercer University blend courses designed for professional adults with engaging 21st century web learning tools like WebEx conferencing and Blackboard learn tools. Ranked as one of the best online colleges in Georgia, Mercer offers a variety of undergraduate and graduate degree programs, including education and engineering. Hybrid programs that combine online learning with in-person classes are also available. Students can sign up for web-based information sessions, for both undergraduate and graduate programs, online. Newly students can work with the university registrar to transfer as many credits as possible from previous college coursework toward their degree requirements. Mercer maintains a close alliance with the military and is a federally-designated "Principles of Excellence" institution, providing priority assistance to active military members and veterans. A Baptist-based university since its founding in 1833, Mercer now enrolls more than 8,600 students at its academic locations in Macon, Atlanta, Savannah, and Columbus, Georgia. Albany State, which merged with Darton State College in 2015, offers a wide variety of online certificates, associate's degrees, and "Advising Pathways"; all prepare students to continue a four-year degree program at another university. As one of the best online colleges in Georgia, Albany State offers the eMajor program, which is a bachelor's degree in Organizational Leadership that can be customized to meet the needs of working professionals, military personnel, and transfer students through transfer and prior learning credit based on previous experience. Online courses are offered in 8- or 16-week terms. Exams requiring proctoring can either be completed online with proctoring software or in a proctored location close to the student's residence. Dedicated online support specialists are available for each program of study. Peer and instructor interaction takes place in group wikis, blogs, video conferencing, and through other educational tools. Students have access to a range of academic resources, including GALILEO -- the GeorgiA LIbrary LEarning Online -- and Smarthinking tutoring services. North Georgia offers a variety of graduate and undergraduate degrees and certificates online. UNG's enrollment has grown by over 3,000 students in four years, with 97 percent of its students at the undergraduate level. UNG, one of the best online colleges in Georgia, is the result of a 2012 merger between the North Georgia College & State University (founded in 1873) and Gainesville State College (founded in 1964). UNG is recognized as one of only six federally-recognized senior military institutions, and is designated as a Carnegie research school and a State Leadership Institution by the University System of Georgia. UNG's eLearning system is supported by BrightSpace. The academic resources center offers access to advising and financial aid resources, online tutoring and library services, proctored exam resources, and more. UNG also trains and makes available Online Student Ambassadors, who serve as mentors for new UNG online students. Armstrong State University offers a select set of online undergraduate and graduate degrees and certificates, and was the only Georgia university to be recognized by U.S. News & World Report for its online criminal justice program in 2017. Armstrong, located just south of historic Savannah, was founded in 1935 and is now part of the University System of Georgia. In addition to ranking as one of the best Georgia online colleges, Armstrong has been recognized as a 2017 Gold-Level Military Friendly School Award recipient for a small public school by Victory Media. As part of a community initiative to encourage adult residents to return to school and earn their associate's degree, Armstrong engages in an ongoing relationship with the nonprofit Savannah Graduates organization. Virtual classrooms are accessible through the Desire2Learn management system and Blackboard Collaborate conferencing software. In addition to a live online orientation, Armstrong offers a year-long series of online monthly student success events as part of its Online First Year Experience. Shorter University is one of the best online colleges in Georgia, offering online degree programs for adult students at various stages in their professional life, including those looking to change their careers or to advance in their current industry. The online degree department has two goals -- to enroll those who have a desire to further their education but also to grow spiritually through the Christian faith. Online courses are structured in an accelerated 8-week format. Shorter University Online has formal initiatives in place as a partner with local businesses that brings its SACSCOC-accredited online degree programs to local employees. Distance learners have access to an online bookstore and library services. Shorter is a private, liberal arts college, founded in the Baptist tradition and located in Rome, Georgia. The school was a women's college until the 1950s, and gained university status in 2010. Located in Rome, Georgia, GHC offers two bachelor's degrees and eight associate degrees that students take completely online. While the school does charge higher rates for non-residents, students can save considerable costs thanks to the school's participation in Affordable Learning Georgia. Through this initiative, instructors deliver coursework via the "open educational resources" format, omitting the need for students to buy textbooks and school supplies. The college also provides numerous scholarship opportunities to mitigate the cost of tuition. To be eligible for admission, first-time students need to have earned a minimum GPA of a 2.0 during their high school studies. Most applicants do not need to submit ACT or SAT scores. The school offers online students access to services like academic advising, technical assistance, and counseling. Founded in 1831, LaGrange is the oldest private college in Georgia, and is also one of the best online colleges in Georgia. Its main campus is located about an hour southwest of Atlanta. Average class size is just 12 students, with a total enrollment of over 1,000 students representing 21 states and 5 countries. LaGrange offers a fully online Master's degree in Strength and Conditioning, with some online courses available for the Master's in Philanthropy and Development. For undergraduate studies, the school has an RN-BSN degree. Online coursework is available for certificates in Aging Studies and Business Essentials. Students complete online exams at a proctored location near to their residence and have virtual access to online library resources, a career center job board, online interview training, and counseling center services. Students can buy and sell books through LaGrange's online book store. FVSU offers a variety of distance education programs to students seeking the convenience and flexibility of online education. Bachelor's degree offerings include majors in criminal justice, organizational leadership, political science, psychology, and rehabilitation counseling. To be accepted to FVSU, first-time students need a minimum 2.25 high school GPA and a score of 17 on both the English and math portions of the ACT. A score of 24 in reading and a 440 in math on the latest version of the SAT may serve in place of ACT scores. Prospective transfer students need at least 30 semester hours at an accredited college or university with a minimum GPA of 2.0. FVSU is located in Fort Valley, a small town in central Georgia. All students pay the same rate for online classes, regardless of their state residency status. 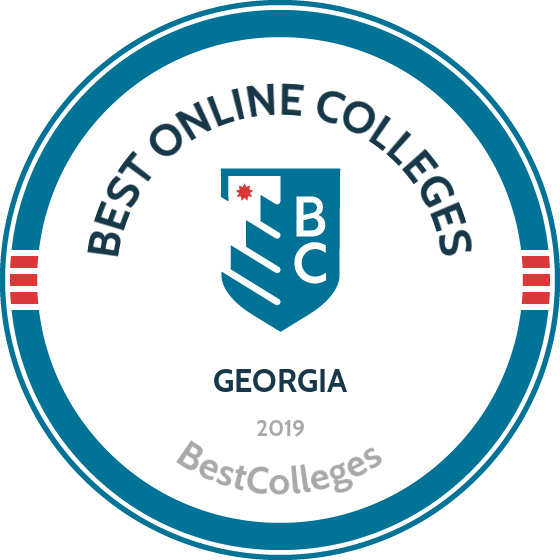 Beulah Heights makes the top-ranking list of Georgia online colleges, offering online Christian Education programs that include an associate's and master's in Religious and Leadership Studies. A new online bachelor's in religious or leadership studies is being offered for the first time in the fall of 2017. Asynchronous courses run a standard 15-week term, and students access the live virtual classroom through Beulah's E360 educational platform. Students have access to the Blackbaud portal for all communication with instructors, online library resources, one-on-one assistance through the writing center, and more. Beulah Heights places ethical leadership and ministry at the core of its mission. Beulah was founded in 1918 as a Bible Institute in the Christian-Protestant tradition and is based in Atlanta. All Beulah programs are accredited by the Transnational Association of Christian Colleges and Schools (TRACS). Beulah will prepare students for ministerial advancement. Point's online associate's and bachelor's degree offerings have propelled the school to the top of the rankings list for online colleges in Georgia. Curriculum is taught with a Christian-based global perspective. Students are prepared to become professionals in their chosen major and serve their community. All Point degrees include at least a minor in Biblical Studies. Most degree paths, with the exception of an associate's in general studies, can be completed as either an associate's or a bachelor's degree. Students can choose fully asynchronous programs or opt for an in-seat, hybrid program, which combines asynchronous online courses with live class meetings on Tuesday or Thursday evenings. Online students have access to counseling services, the Educational Resource Center, Spiritual Formation Opportunities, and more. Point is a private, liberal arts institution, with a main campus in West Point, Georgia, and five additional state-based locations, including Atlanta and Savannah. Point University's programs are SACSCOC-accredited. Our affordability methodology considers value-driven metrics and ranks schools that have low tuition rates, as well as proven graduation rates and employment outcomes that provide a high ROI for students. For students in Georgia, there are plenty of opportunities to find an affordable program locally. While distance education provides more flexibility than an exclusively residential curriculum, there are still plenty of advantages to attending a local online college, including access to lower tuition prices and local scholarships. If you're considering going back to school, and are thinking about studying online, the following list of cheap accredited online colleges in Georgia will help you start your search. The University of Georgia is one of the most colleges in Georgia. The school has satellite campuses in Athens, Atlanta, Griffin, Gwinnett, and Tipton. UGA offers an extensive list of online programs for undergraduate and graduate students. UGA uses the eLearning Commons interface for online courses. Degrees, such as the baccalaureate in business administration, are conferred through the Terry School of Business. On-campus faculty members teach and supervise online classes with curricula objectives that mirror on-campus courses. Students pay the same rate of tuition regardless of their residency status. Most online programs take two-and-a-half to three years to complete. Class sizes are capped, allowing for greater student-teacher interaction. Kennesaw State University consists of 13 colleges that offer more than 150 degrees, 70 of which are available online. KSU is a member of the Southern Regional Education Board’s electronic campus, which provides information regarding online courses and programs at KSU. Online programs include engineering technology and nursing. The Office of Registrar performs transfer credit evaluations for transfer students. KSU has an eCore program, which allows students to complete general education courses through other affordable Georgia universities. At least 95% of online programs are asynchronous. The school also offers program in a hybrid format. The University of North Georgia, founded in 1873 in Dahlonega, is a military-based institution of higher education that consists of two colleges: North Georgia College & State University and Gainesville State College. UNG online allows students to select asynchronous or synchronous classes based on their schedule and needs. Undergraduates use the eCore system to complete core requirements at participating colleges in Georgia. UNG online offers undergraduate and graduate degrees in criminal justice and international affairs. UNG nursing students enjoy the option to complete courses completely online. Middle Georgia State University is accredited by the Southern Association of Colleges and Schools Commission on Colleges and has earned specialized accreditation for their nursing, information technology, therapy, and education programs. The University operates satellite campuses throughout Georgia that support their distance education programs. MGA has partnered with the University System of Georgia to offer eCore and eCampus programs. Distance learners pay a special rate of tuition through the school’s eTuition program. Students pay on-campus tuition for hybrid and synchronous classes. MGA waives the tuition cap rate and certain fees for fully online courses. The Office of Disability Services provides additional resources to distance learners, such as text to speech software. Mercer University consists of nine colleges and five hospitals. The University also offers degrees and courses through regional academic centers in satellite locations. Distance programs are offered through fully-online and hybrid formats. As one of the most affordable Georgia universities, Mercer emphasizes small class sizes to help students learn more effectively. Distance learners are required to attend an on-campus orientation session. Hybrid program students attend classes at satellite campuses or regional academic centers. Tuition rates are the same for online and on-campus students, but rates differ between campuses and regional academic centers. Mercer delivers online courses through the Moodle or Canvas learning management systems. Atlanta Metropolitan State College offers distance learners a free assessment called the Smarter Measure Assessment to test their readiness for online courses. AMSC joins the list as one of the most affordable online colleges in Georgia. On-campus instructors oversee the school’s two online programs, which include general studies and business administration. Some courses require in-person proctored exams, so students must make arrangements with the instructor to take the exam on-campus. AMSC uses the Desire2Learn learning management system to connect students with instructors, courses, and syllabi. The school accepts applications for fall, spring, and summer semesters. Georgia Southern University, founded in 1906, offers degrees in 119 majors. GSU delivers online courses through the Desire2Learn learning management system. Students access courses through the school’s GoView interface. Online tuition differs from on-campus rates, but in-state and out-of-state distance learners pay the same tuition price. GSU waives technology and university fees for online graduate students. Admission requirements for online graduate programs include an application fee, GMAT scores, and two letters of recommendation. Distance learners should check the school’s online portal for state authorization. Armstrong State University was founded in the 1930s and became a member of the University System of Georgia in 1959. In 2017, the Georgia Board of Regents voted to consolidate Armstrong State University with Georgia State University. Armstrong offers 17 online programs. On-campus faculty members serve as online course instructors for the university’s online school. Courses are taught through synchronous and asynchronous formats. Armstrong uses the Desire2Learn platform. The Blackboard Collaborate interface is used for webcasting. Distance learners use Blackboard Collaborate to attend online student orientations and the first year experience program. The University assigns academic advisers to guide students through their programs. Columbus State University offers three online learning options for distance learners: fully online, partially online, and hybrid online. Partially online courses are 50-90% online, and include on-campus sessions. Students select courses that fit their schedule and degree requirements. Online and on-campus tuition rates differ from eCore rates. The University waives the 15-credit tuition cap for distance learners. Mandatory fees include the technology fee, which provides software licensing for students. For working professionals, the University offers an adult resource center and academic center for excellence. Columbus State University delivers online courses through the Desire2Learn learning system using the CougarVIEW interface. After receiving the designation of University in 1996, UWG became the sixth largest university in Georgia. The school’s online programs award undergraduate and graduate level degrees. Online courses are delivered completely or partially online. Students majoring in nursing, political science, sociology, and criminology choose between a fully synchronous or asynchronous program. UWG offers the BS in organizational leadership through the eMajor program, a completely online program collaboration between UWG and the University System of Georgia. The Credit by Prior Learning program allows students over the age of 25 to receive college credit for prior work experience or CLEP exams. Brenau University was established in 1878 as a women’s college. The school began accepting male students in the 1970s. The Gainesville Women’s College campus is still open exclusively to female students. The University’s online school consists of 16 programs that are offered completely online. Courses last seven weeks, and students commit five to seven days per week to course study. Brenau has a team of online faculty members dedicated to instructing all online programs. Instructors go through a rigorous orientation program before teaching their first online course. Tuition rates are the same for on-campus and online students. Clayton State University, located in Morrow, became a full-fledged university in 1969. The institution offers online programs through their distance learning school. Fully online courses are taught in eight or 16-week increments. The accelerated eight-week programs allow students to graduate quickly. Transfer students can transfer up to 30 credits. Transfer credits must have been earned with a minimum 2.0 grade. Distance learners pay a special tuition rate that eliminates on-campus fees, such as health insurance and parking. Online bachelor's programs include dental hygiene, business administration, and nursing. Valdosta State University offers more than 40 degrees and certificates online. The Office of Extended Learning oversees the school’s online programs. VSU offers an accelerated program that helps degree candidates complete core courses in three semesters. SmartPath core courses are a bridge to VSU online programs. Courses last eight weeks, and students can enroll throughout the year. VSU is one of the only colleges in Georgia with a SmartPath program. Distance learners pay a specialized tuition rate known as eTution, which has different rates for graduate and undergraduate students. The University waives on-campus fees for distance learners. Dalton State College is among colleges in Georgia that administer eLearning, eCore, and eMajor courses. The eLearning courses are offered exclusively through Dalton. Students take the DSC eLearning quiz before registering for online courses. The University System of Georgia manages eCore and eMajor courses in partnership with Dalton. The eCore and eMajor distance learners take online courses taught by faculty members at other affordable online colleges in Georgia. Dalton allows online students to take eLearning courses in conjunction with eCore and eMajor programs. Tuition rates for eLearning, eCore, and eMajor classes vary, but the school waives the tuition cap for all online courses. Reinhardt University's online school offers programs in business administration, criminal justice, and healthcare administration. The school accepts transfer credits from all regionally accredited institutions. Veterans and officers can obtain college credit for military training. All programs are asynchronous, with no on-campus requirements. Students use the VCamp360 learning management system to access courses and learning materials. Distance learners receive student success coaches to help them navigate online programs. The university offers free tutoring through the Brainfuse learning resource. Online students receive a laptop and online textbooks after paying tuition. The College of Coastal Georgia offers four types of distance education programs: fully online, partially online, hybrid, and technologically advanced. Hybrid and technologically advanced classes require 50% or less online instruction. The school uses the Brightspace learning management system to deliver coursework online. As one of the affordable online colleges in Georgia, the college participates in the eCore program. Transient students (students enrolled at the school for three semesters or less) can also take online courses. Online bachelor's programs include nursing, human services, and workforce management and leadership. Albany State University is one of the most affordable online colleges in Georgia. Courses in allied health, emergency medical services, and accounting are available online. The five colleges within the university dispatch designated online support specialists to mentor distance learners. Albany State also provides online writing and math centers. Students from Alabama, South Carolina, and Florida receive a tuition waiver. Programs, such as the hybrid nursing degree track, have specific pre application requirements. Most online courses are hybrid programs, requiring students to attend on-campus meetings at the university’s satellite locations. Point University is a faith-based institution with a comprehensive online program. Distance learners can major in the arts and sciences, bible and ministry, education, the social sciences, or business and leadership. The admissions process for distance learners requires an online application and official high school or college transcripts. Online tuition rates are different from on-campus rates, but tuition payment plans and financial aid are available for all distance learners. Students eligible for stipends will receive them electronically. Programs are taught entirely online and can be completed in two years. Students can transfer up to 30 credits. Class sizes are small, usually containing less than 20 students, which provides optimal student-teacher interaction. Toccoa Falls College prides itself on being one of the most affordable online colleges in Georgia. The faith-based institution boasts top-ranked online programs. Tuition is calculated based on credit hours and classes. Distance learners enrolled in a minimum of two classes qualify for financial aid. Toccoa Falls offers associate and baccalaureate programs in criminal justice, biblical studies, and sports management. The school also provides course plans to education majors to help them map out their degree track. Toccoa Falls employs an online librarian to handle book requests from distance learners. Additional TFC online faculty members include a career counselor, director of online outreach, and tutoring director. Founded in Atlanta, Beulah Heights University offers a comprehensive program for distance learners. The faith-based institution uses the E360 learning management system to deliver courses and other educational resources to students. Distance learners participate in virtual classrooms that are designed to connect online peers. The Blackboard portal allows students to chat directly with course instructors. Online students receive weekly assignments. Online courses follow the same 15-week format as on-campus classes. Applicants apply online by completing the university's electronic application. Accepted students send tuition payments through the Smart Tuition website. LaGrange College, the oldest private institution in Georgia, awards baccalaureate liberal arts degrees to on-campus and online students. LaGrange is among the list of affordable online colleges in Georgia. The online program offers graduate degrees in strength and conditioning and philanthropy and development. Graduate strength and conditioning students choose between a master of arts or master of science. During the school's interim periods, students take accelerated courses to complete their degree track. LaGrange uses the Moodle learning management system. Online students pay per semester hour and are eligible to receive financial aid. Students entering majors like nursing must apply for general admission to the college before applying to the program. Savannah State University has been awarding degrees for over 120 years. The Office of Online Education handles online programs and supervises faculty members. Online courses are student or instructor-paced. Savannah State uses the Brightspace Desire2Learn platform to administer online courses. Students are expected to log onto the platform at least three times per week to complete coursework. Students can also access eCore classes using their school credentials. Transfer and working-professional students complete the prior learning assessment to gain college credit hours for previous experience. In-state and out-of-state students pay different tuition rates. Shorter University students use the school's SCHOLAR program to apply for online programs. Distance learners apply directly to their program. Admission requirements include official transcript and SAT and GMAT scores. Transfer students must submit all college transcripts. Shorter University bills students per credit hour. Military veterans qualify for a discounted tuition rate. Shorter University is a faith-based institution that offers undergraduate and graduate degrees in christian studies, healthcare management, and criminal justice. The bachelor of science in criminal justice is a 120 semester hour program that is available entirely online. Thomas University, located in suburban Thomasville, has satellite locations in Florida and China. Online students pursue advanced degrees using the latest academic technology. Admission into graduate programs require a professional resume, official transcripts, and letters of recommendation. The Dynamic Learning Environments division provides support services to distance learners. Students access course content through the Blackboard learning management system. Thomas uses ProctorU to virtually proctor exams. The Dynamic Learning Environment's workshops are accessible by students and faculty by using their Thomas University accounts. The school bills tuition rates based on enrollment status and degree level, not residency. The Georgia Blue Ridge Mountains are home to faith-based Truett McConnell University. Truett McConnell has a dedicated team of online faculty members that work exclusively with distance learners to provide support services. Online students are billed per credit hour and pay a technology fee each term. Online classes span eight weeks during the fall and spring semesters. Distance learners receive weekly assignments and dedicate at least six hours per week to courses. Students purchase books through the online bookstore and register for classes using their university credentials. Truett McConnell uses the Brightspace learning management system to deliver online courses. Students interested in attending online schools in Georgia discover that earning an increasingly necessary postsecondary education opens the door to potentially lucrative careers. According to the Georgia Budget & Policy Institute, Georgia boasts one of the country's most abundant merit-based grant systems and a diverse student population across its many state public and private institutions. Use this page to learn more about earning your degree in Georgia and how to fund your education. Many students in Georgia attend on-campus programs at one of the state's 52 four-year institutions or 23 technical schools. Attending an on-campus program provides a traditional higher education experience, and often best suits students entering college directly from high school who plan to attend classes full-time. Many on-campus students live on or near campus to reduce commuting. These students may also maintain a stronger campus involvement through athletics or campus organizations. Online programs have become increasingly more popular and widely available in recent years. These programs allow learners to earn their degree away from campus, eliminating a commute and allowing the flexibility to maintain a job while working on coursework. Online programs differ from traditional programs simply in the lack of an on-campus element, though some online programs include small on-campus requirements or residencies. Online schools in Georgia provide non-traditional and older students returning to school a way to earn their degree without interrupting their life. Accelerated online programs also offer a method to earn your degree at a quicker pace. Students can often complete degree requirements in less time than a traditional on-campus program. Online programs include the same quality education as their on-campus counterparts, just with the added flexibility of earning your degree anywhere, anytime. Hybrid programs allow learners to take some courses on campus and supplement with online courses. These programs provide flexibility in how many courses each student takes online and on campus, and sometimes include specific courses offered exclusively through campus or distance learning. Hybrid programs differ from online programs in that they inherently include some on-campus elements, while the majority of coursework for an online program takes place through distance learning. Some on-campus students may also take select online courses in addition to their on-campus coursework. Price should always factor into your consideration when choosing a college. Tuition costs vary by school and often increase for out-of-state and graduate students. Fortunately for students in Georgia, many state-funded grant opportunities exist to help pay for higher education. In this section, explore how to pay for your online bachelor's degree in Georgia and obtain information on applying for federal financial aid in the state. The price of attending a public two- or four-year institution varies by school and often changes from year to year. While understanding tuition costs marks an important step in choosing a college, you also must consider non-tuition costs, such as textbooks, transportation, and housing. These elements factor into your total education cost. Every student, regardless of family or personal income, should take advantage of financial aid. In order to have access to any form of federal or state funding, every student must submit the Free Application for Federal Student Aid (FAFSA). This determines your need and eligibility for all kinds of financial awards, including loans, grants, and scholarships. Individual schools use the FAFSA to award school-based grants and scholarships to learners. Grants and scholarships do not require repayment, so you should accept these types of aid before accepting any federal or private loans, which you must repay upon graduating or terminating studies. Despite their inherent differences, online programs and on-campus programs offer students the same financial aid opportunities. Student submit their FAFSA and send it to their chosen schools. The schools then award any potential aid, which students apply toward their online tuition and fees. Tuition for online programs generally runs the same as on-campus options. However, online students can benefit from saving on some fees on-campus students often incur, such as transportation, childcare, and on-campus housing. Online classes also sometimes offer online textbooks that cost less than physical copies. In addition to student loans, scholarships and grants provide an ideal way to fund your education without the necessity of repayment. Students attending online classes in Georgia can pursue many scholarships, including financial aid specific to students in this state. See below for a few examples of scholarships available to students pursuing online degrees in Georgia. Who Can Apply: Georgia residents with a diploma or GED from an eligible Georgia high school or home-based program with a minimum 3.0 GPA may apply. Recipients must maintain a 3.0 GPA through their college coursework to keep their award. Who Can Apply: Georgia residents with a diploma or GED from an eligible high school or home school program with a minimum 3.7 GPA may apply. Students must be enrolled or plan to enroll in an eligible institution. Who Can Apply: Applicants must have received a diploma from the Technical College System of Georgia, and must meet Georgia residency requirements. Individuals must enroll in an eligible postsecondary institution in Georgia. Who Can Apply: Members of the Georgia National Guard and U.S. Military Reservists who have served in combat, as well as their spouses and children, may apply for this award. Recipients must attend an eligible Georgia postsecondary institution. Who Can Apply: Applicants must be Georgia residents attending an eligible private institution within the state. Funds apply towards tuition costs to offset the difference between private and public school tuition. Recipients must maintain certain academic success. The largest state in the Southeast, there are dozens of colleges and universities spread across Georgia. On-the-whole, tuition and fees at Georgia colleges and universities have risen by 74.2% over the last five years, while funds allocated for postsecondary education in the state have dropped by more than 5% during that time. In response, students pursuing higher education degrees in Georgia have increasingly looked online, where tuition and associated costs are much lower. Browse our list of the best online colleges in Georgia for more insight into distance learning programs in this state. As of fall 2012, NCES reports indicate that 9.6% (53,428) of students enrolled in Title IV institutions in Georgia studied in exclusively online programs. Georgia's USG network provides broad access to online learning resources for distance learners at every level of higher education. Through USG's Georgia on My Line consortium, online students may pursue college-level courses and programs at all colleges and universities in the system. GAfutures.org provides comprehensive web-based resources for all aspects of the higher learning process for college-bound students and adult learners, from selecting a school and securing financial aid to researching a career in Georgia. Many two-year and four-year schools in the state now offer fully online delivery options. In Georgia, employment growth in this profession is strong. According to the Georgia Department of Labor, long term projections show an increase of 20% in the total number of relevant jobs between 2014 and 2024. Wages increased by 5% from 2011-2016. In Georgia, what were the top careers in 2016 for people who had a degree in registered nursing? Data source: Georgia Department of Labor, Bureau of Labor Statistics. Data may not be available for every year. In Georgia, employment growth in this profession is moderate. According to the Georgia Department of Labor, long term projections show an increase of 12% in the total number of jobs between 2014 and 2024. Wages increased by 6% from 2011-2016. In Georgia, what were the top careers in 2016 for people who had a degree in business administration and management? In Georgia, employment growth in this profession is strong. According to the Georgia Department of Labor, long term projections show an increase of 146% in the total number of jobs between 2014 and 2024. Wages increased by 8% from 2011-2016. In Georgia, what were the top careers in 2016 for people who had a degree in criminal justice/law enforcement administration? In Georgia, employment growth in this profession is strong. According to the Georgia Department of Labor, long term projections show an increase of 34% in the total number of relevant jobs between 2014 and 2024. Wages decreased by 2% from 2011-2016. In Georgia, what were the top careers in 2016 for people who had a degree in Organizational Leadership? In Georgia, what were the top careers in 2016 for people who had a degree in business/commerce?